What format should the SD memory have for it to work with the EOL Zenith? If you are using the SD memory card that was supplied together with the data logger, the SD card is already formatted. The SD card is now formatted correctly. Can I use any SD memory card with the data logger? Yes, you can use any SD memory card (with a maximum capacity of 2GB). However, not all SD memory cards have the same quality. We strongly recommend using the industrial grade SD memory card that is supplied together with the data logger. Please make sure that the SD card is correctly formatted before use. How does the data management system work for the EOL Zenith? 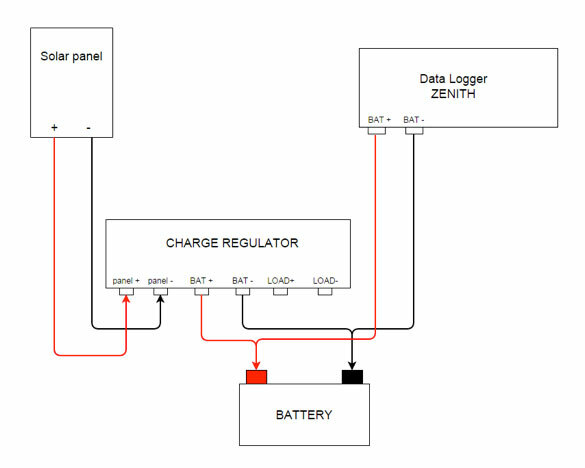 The EOL Manager is used to prepare the configuration file for the EOL Zenith data logger. The .sit file (configuration file) is then uploaded to the data logger. I need a SIM card that enables internet connection to my Kintech data logger. Where can I get it? Because of the extensive number of customers with wind & solar measurement campaigns in several different countries we know that many of you find it difficult to acquire local SIM cards with the optimal settings and local GPRS / 3G coverage. We have listened to your feedback and the need for a more effective way to handle this. Our engineers have been working on this for a while and have come up with a solution for a single SIM card that offers Internet connection to your data loggers and works in practically all countries worldwide. A single SIM card that checks for all the available local GPRS / 3G signals and automatically connects to the operator with the best coverage. This has in many cases demonstrated to improve and simplify communications compared to conventional SIM cards that just work with a single operator. There is no GSM coverage on the site where I plan to install my next wind measurement mast. What should I do? What battery should I use for the data logger? We recommend using a flotation (back-up) sealed lead-acid battery (12VDC). This kind of battery has no maintenance and can be transported in any orientation. If you are performing wind measurement and are using an internet / GSM connection to your data logger, we recommend using a 24Ah battery. This gives autonomy of approximately 1 month without the battery being recharged. How do I make sure my solar panel is charging the battery correctly? To test that the solar power supply system has been installed and performs properly you need a multimeter set to “Read Current” mode. To begin with you should check if the output from the solar panel is correct. You should do this on a sunny day (Please connect the multimeter as shown in the drawing below). In addition to dimensioning the solar power supply system correctly, it is important to position the solar panels appropriately for maximum electricity production. 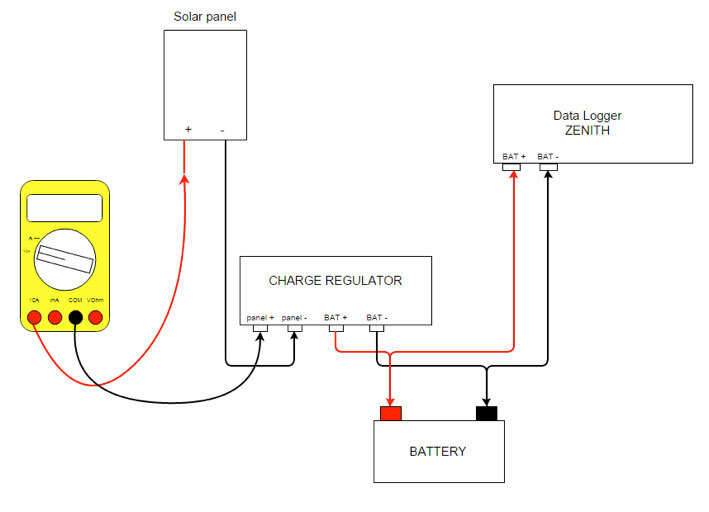 How should I install the solar panel for charging the battery? In addition to dimensioning the solar power supply system correctly, it is important to orientate the solar panels appropriately for maximizing the energy production during the season with less sun energy. 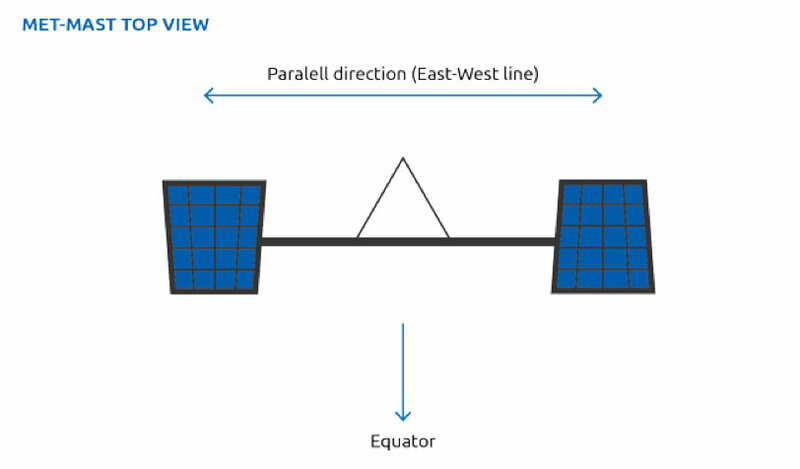 In general the solar panel should be facing GEOGRAPHICAL SOUTH in the Northern hemisphere and GEOGRAPHICAL NORTH in the Southern hemisphere. And as a rule of thumb the inclination of the solar panel should be the latitude of the site where you are installing the solar panel -10°. E.g. For an installation in Germany, close to Frankfurt (with latitude 50° N) you should orientate the solar panel towards SOUTH and with an inclination of 40° with respect to horizontal. For sites in the North (e.g. Scandinavia), or where there may be very little sunlight during certain periods of the year, an individual solar radiation calculation should be carried out. You can contact our technical support for help on this. In inter-tropical latitudes the sun can be located either North or South. In the equator, for example, the met mast structure shadow is projected to the South for 6 months and to the North for the other 6 months. This of course lowers the radiation on the solar panel and we therefore recommend installing two separate solar panels. 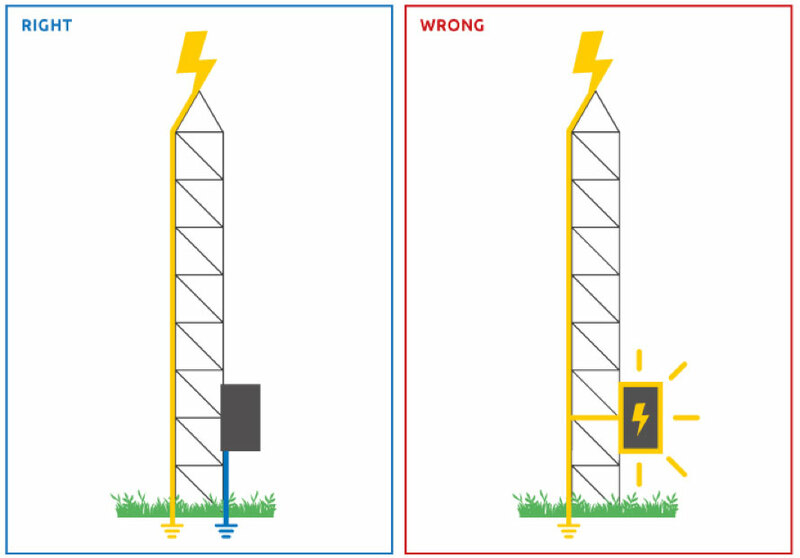 If you are going to install two separate solar panels, we recommend the following configuration (see images below). 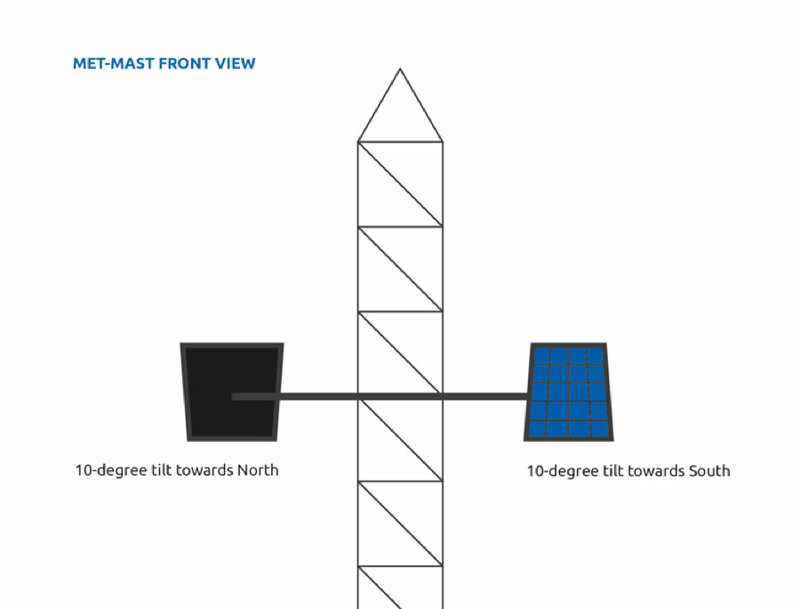 Both panels are to be installed in booms parallels to the West-East Earth axis, with one solar panel pointed towards the North (and tilted approx. 10°) and the other one pointed towards the South (and tilted approx. 10°). The charging efficiency is increased by using independent solar chargers for each solar panel. How should I connect the power supply to the EOL Zenith data logger? 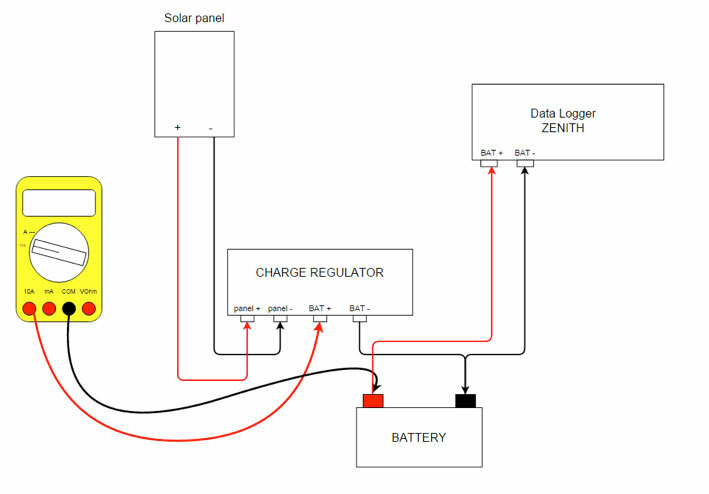 Usually solar power systems for the EOL Zenith consist of a solar panel, a charge controller and a battery. Always connect the battery terminals directly to the BAT + and – on the data logger. Do not connect the LOAD+ and LOAD- to the data logger. The reason we recommend this is to avoid the regulator to switch off its outputs when the battery drops below a certain cutoff limit for the regulator. Keep in mind that the data logger can work with 5V. See drawing below. How should I ground the data logger correctly? To ground the EOL Zenith®, connect one end of the copper ground wire (usually yellow-green color) to the data logger GND terminal and the other end to an independent grounding spike. If the enclosure is metallic you must also connect the enclosure to the ground wire, to do so, all metallic enclosures have a connection screw terminal with the ground symbol on it.